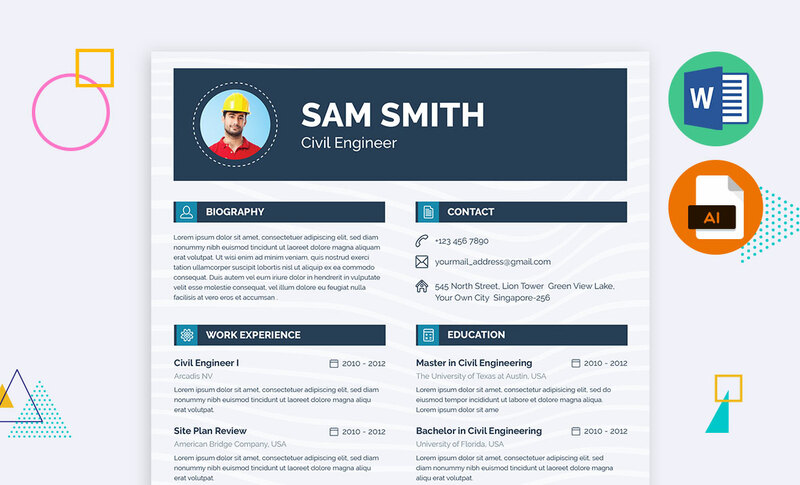 Civil engineering resume template is unique and elegant resume template for Civil Engineers. This resume template is available in Word (Docx, Doc), Vector EPS and AI. This resume template is specially designed for the Civil engineers, who are looking for a great job. We think that this unique resume template will make you different from others and will increase the possibilities of getting interview calls. The application list you can use to edit this lawyer resume template. -You can use Microsoft Word application and Adobe Illustrator to edit and customize by your self. The list of formats available for this resume template. – You will get Docx, Doc, AI and EPS for this resume template. This resume template is also designed for A4 size paper. You can easily print this template by on a standard size A4 paper. Don’t have any previous experiences about how to build a resume template? – If you are not familiar with how to build a resume then you are welcome to contact us. Our expert writers will help you to build your resume template by your information. Visit there to make an order. After the confirmation, we will start your resume building immediately. Looking for a further support? – Our dedicated team members are always ready to help you. If you face any problem to edit or don’t understand any issues when editing the resume template then feel free to ask help to us. We will respond back in a while.